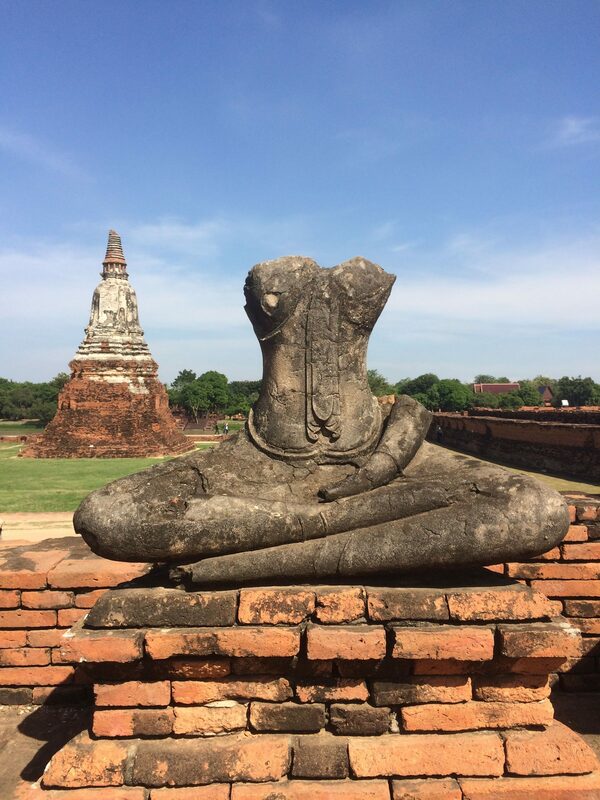 I have been to Ayutthaya 3 times and have had a different experience each time. The first time, I went with 2 fellow foreigners. 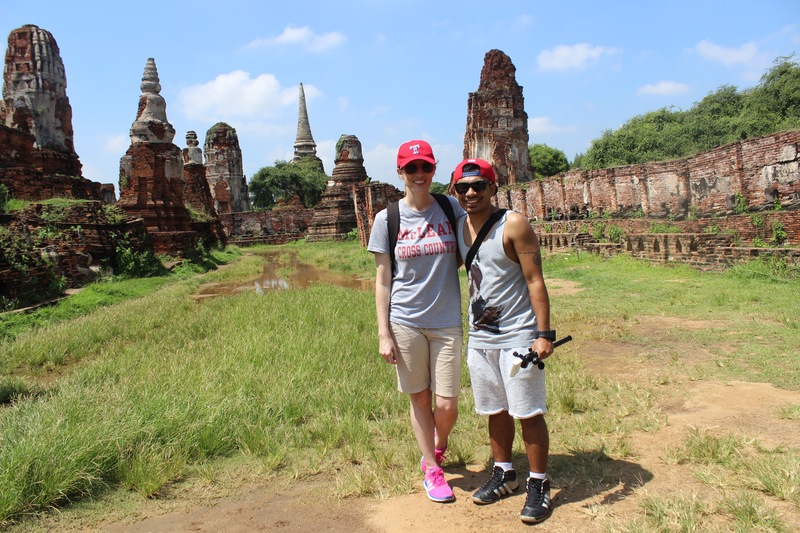 We took a (very fast) van to Ayutthaya and then rented (very old) bikes to ride around the temples. I’m pretty sure this is the hottest way to see the ruins. 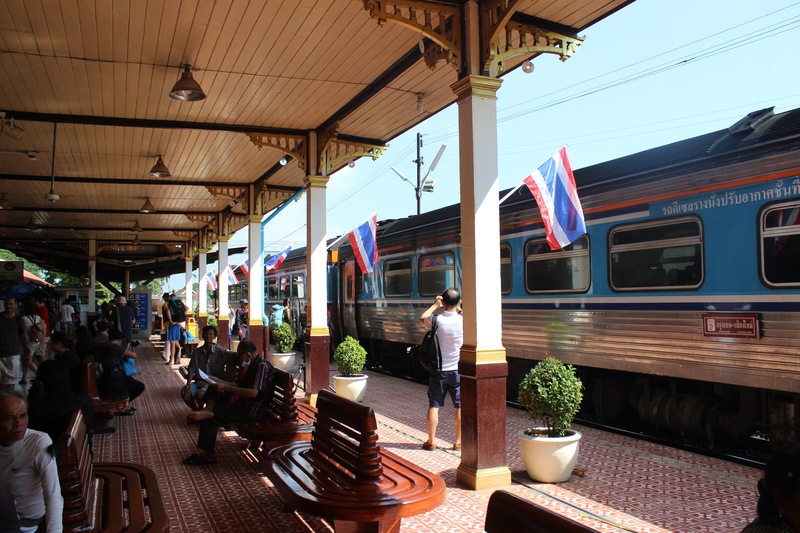 The second time, Worchihan and I took the (rather slow) train from Hua Lamphong with a group of Thai and Naga friends. Since we didn’t buy our tickets in advance, we got 3rd class standee tickets (can’t complain when they’re only 20 baht! ), but fortunately we were able to sit all the way. On the way back to Bangkok, we ended up with 3rd class standee tickets again on a pretty full train; Worchihan and I ended up standing outside between two cars, which was a little scary. 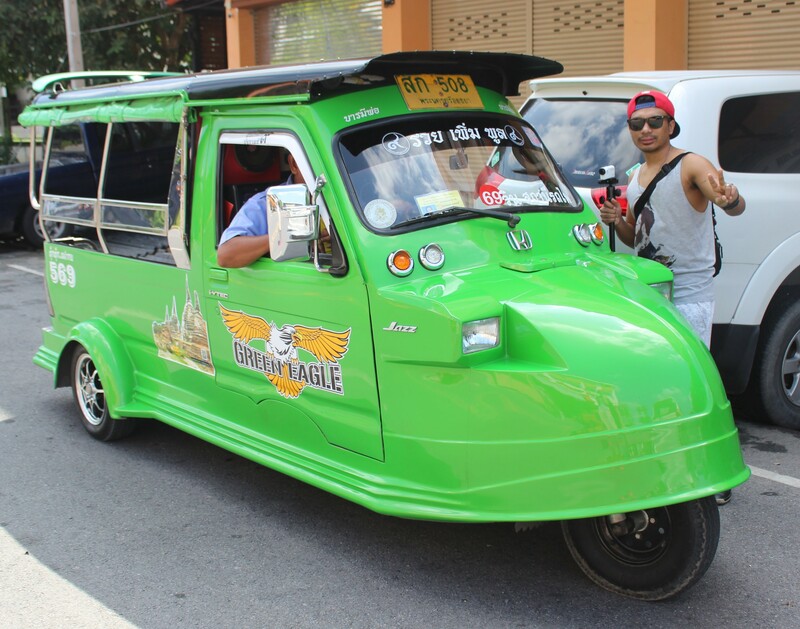 Anyways, on that trip we rented a long tuktuk (and driver) for a price a little bit cheaper than what foreigners would pay. 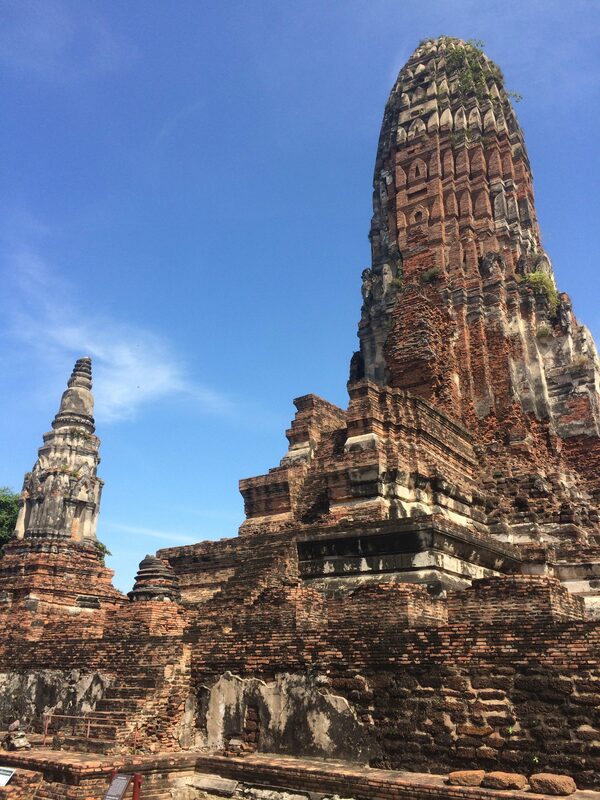 The third time, this past Saturday, our friends Ping and Som took us, so we drove to Ayutthaya and then drove around to see the temples, which is the most comfortable way to go. 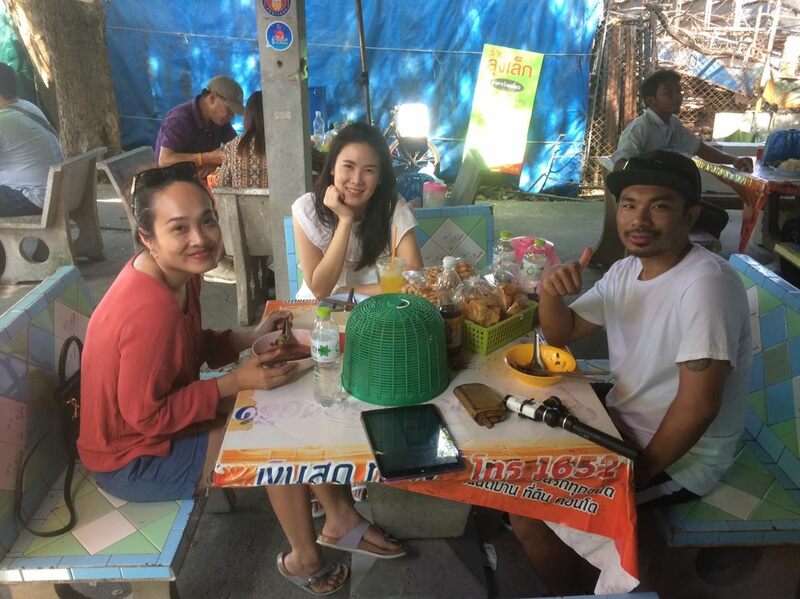 Going with Thai friends in a car is the best way to go! The temples are open to visitors from 8:00 AM to 6:30 PM. Many temples charge an entry fee. 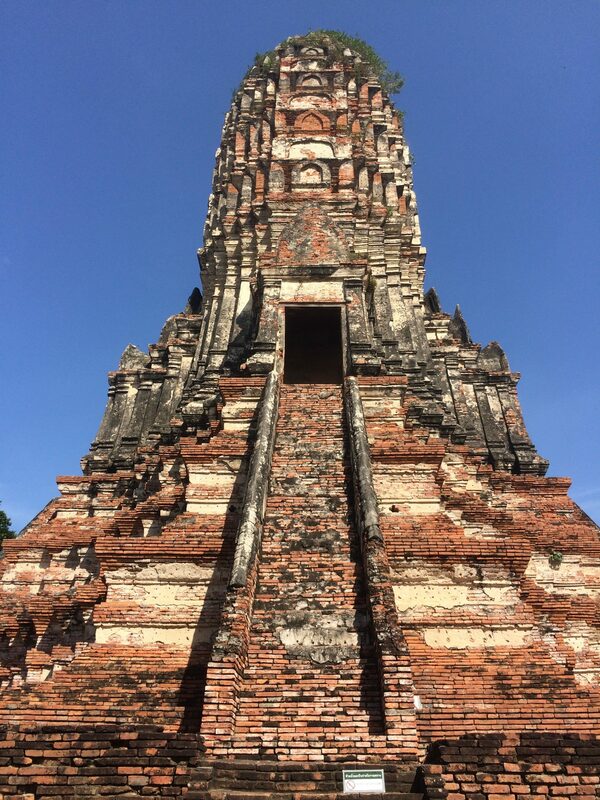 Foreigners pay 50 baht per temple or 220 baht for entry into 6 temples (which I believe are Wat Mahathat, Wat Ratchaburana, Wat Phra Sri Sanphet, Wat Phra Ram, Wat Chaiwatthanaram and Wat Maheyong). Thais pay only 10 baht per temple. All of the temples I visited charged an entry fee. Women, don’t wear shorts shorter than Bermuda shorts. If you do, you will have to buy a skirt or pants to enter the temples. Also, don’t wear sleeveless or you’ll have to cover your shoulders with a scarf. Hats are okay to wear in the temple ruins. 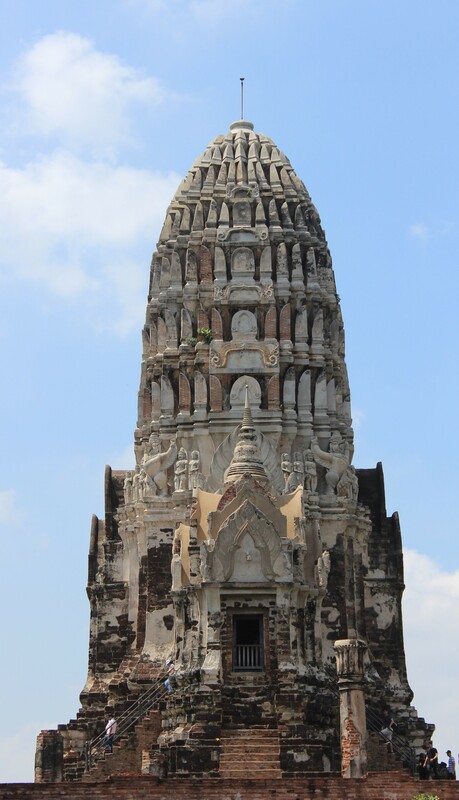 Built in 1370, Wat Mahathat was Ayutthaya’s most important temple. 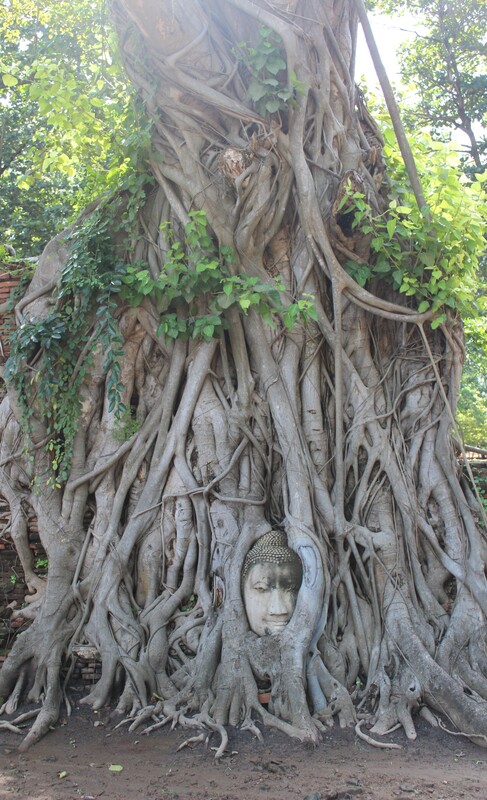 It is also probably the most famous of all of Ayutthaya’s temples, only because of the Buddha head framed by the roots of a tree. It can take a while to get the picture you want as there’s often a crowd. There are several little shops here where you can buy hats, sarongs and most importantly, smoothies. Wat Ratchaburana is across the street from Wat Mahathat. 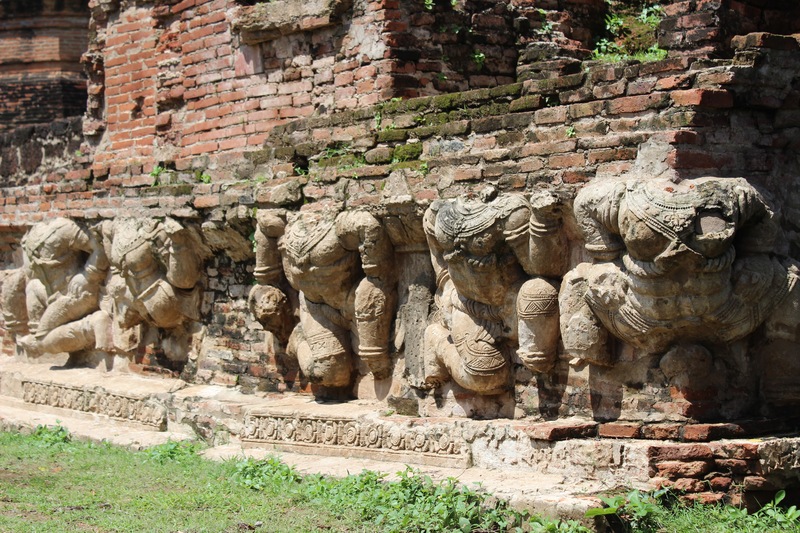 You can see quite a few mythical creatures at this temple. Wat Phra Sri Sanphet is probably my favorite temple, I think because of the three chedis. 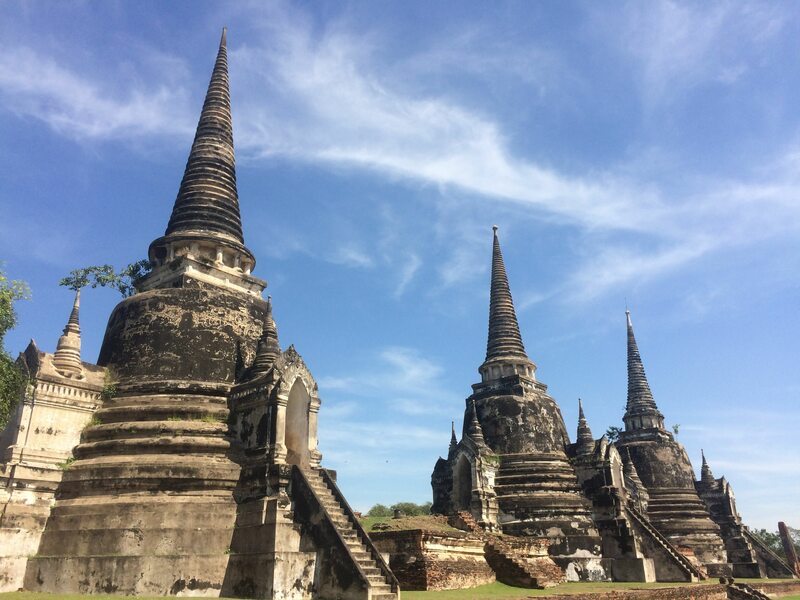 This temple was a royal temple on palace grounds; the three chedis house the ashes of three kings. 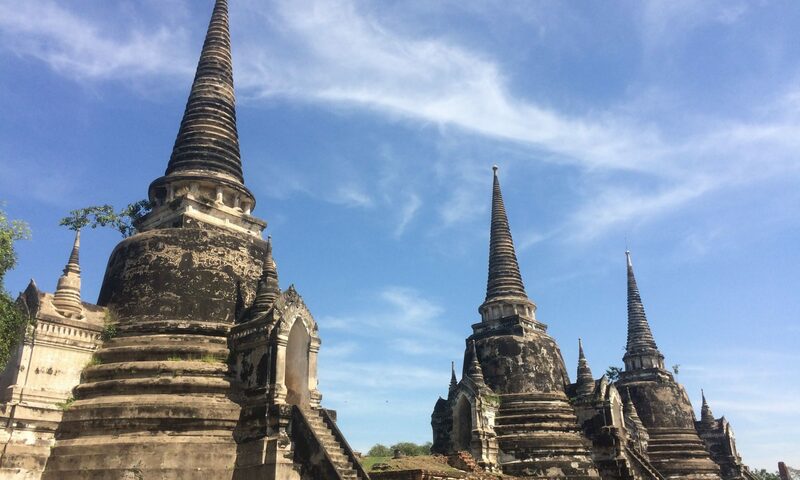 The first time I went to Ayutthaya, you could climb the chedis, but now there are No climbing signs. There is a tourist office outside this temple where you can ask questions and get free maps. You can also borrow an umbrella outside this temple, not in case of rain, but as a shield against the sun. 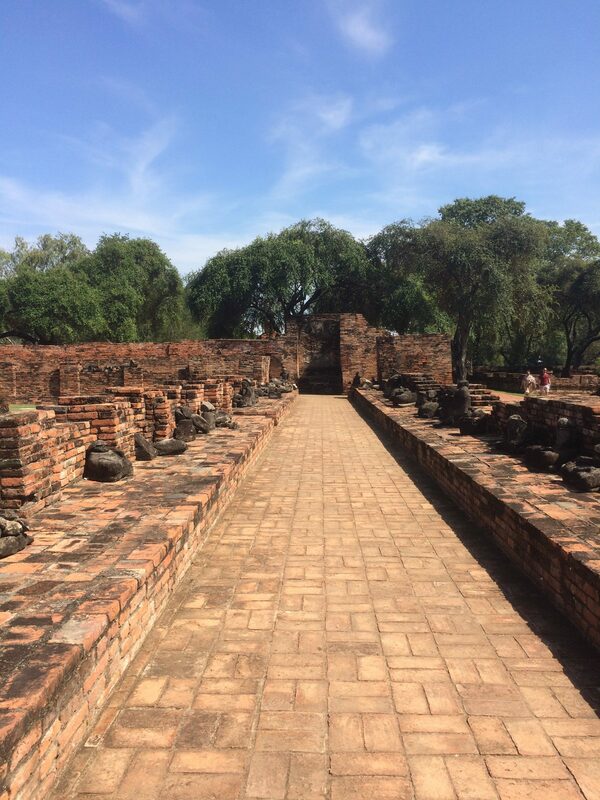 Across the street from Wat Phra Sri Sanphet is Wat Phra Ram, which is thankfully very shaded and quiet. 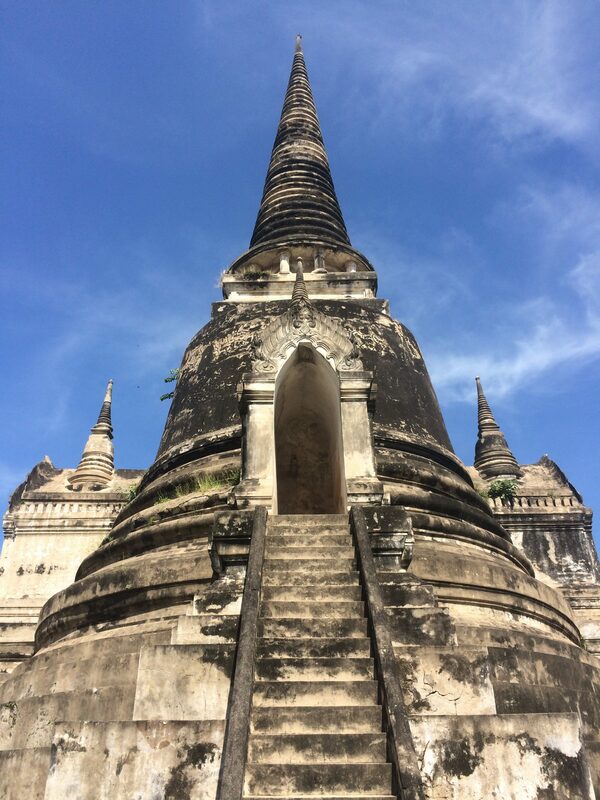 Wat Chaiwatthanaram sits along the banks of the Chao Phraya River, the same Chao Phraya River that flows through Bangkok and empties into the Gulf of Thailand. 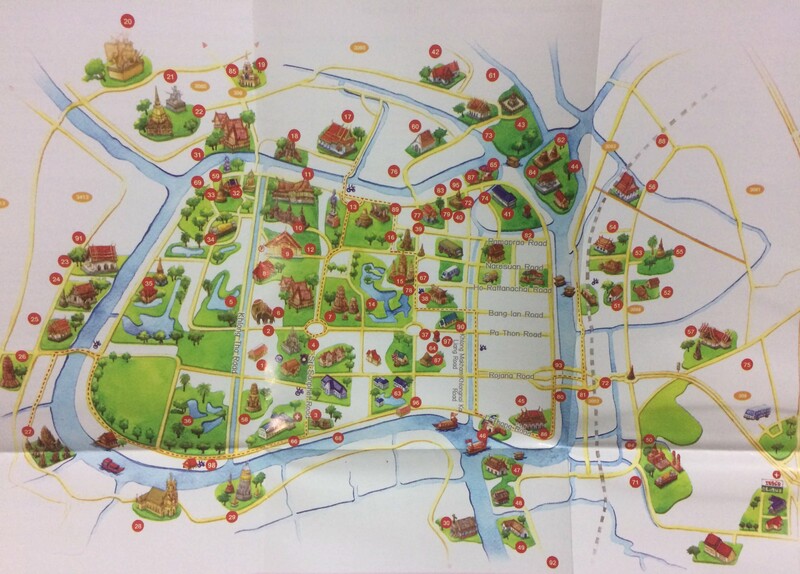 It is also right across the river from Queen Sirikit Palace. 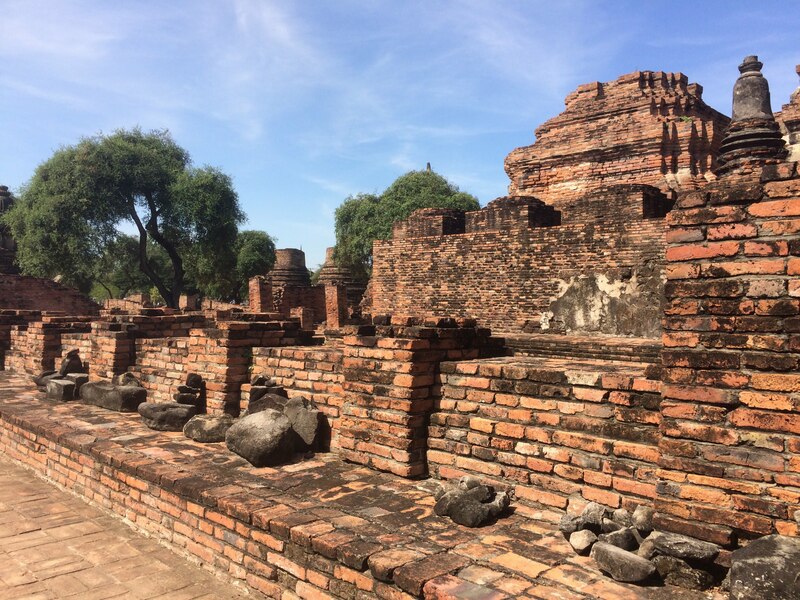 This temple was part of a royal temple complex and was also a monastery. We saw quite a few people wearing traditional Thai clothes walking around the temple taking pictures. Across the street from a temple is a strip of shops across the street from the temple, almost all of which sell or rent traditional Thai clothes. 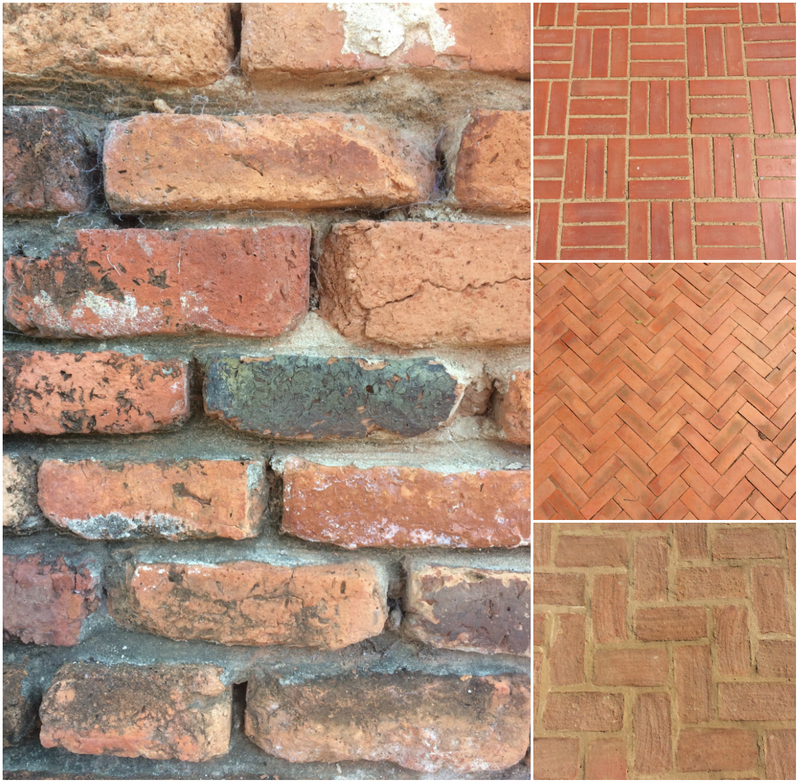 What I enjoyed the most this trip was the textures and patterns I noticed. 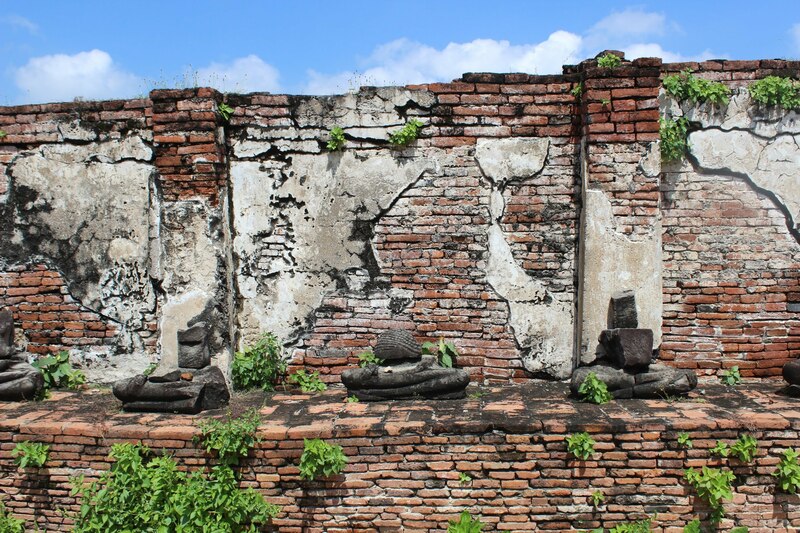 The brick is from Wat Phra Sri Sanphet, while the 3 other pictures are from new walkways around Wat Phra Sri Sanphet and Wat Chaiwatthanaram that are still being laid. Aren’t they all beautiful? Ping and Som took us to a popular boat noodle shop (boat noodles are called boat noodles because they were once sold from boats) called Lunglek Noodle for lunch. The shop is across the street from Wat Mahathat, which now has quite a few more upscale, indoor restaurants and coffee shops to lure the tourists, but it’s best to stick with the cheaper outdoor places. We also had some roti sai mai, known as Thailand’s cotton candy, which is a sweet snack popular in Ayutthaya. The roti is essentially a sweet, thin tortilla and the sai mai is sugar strings that look like hair and come in different colors. To eat it, you just wrap up the sai mai in the roti and eat it like a burrito. I’ve had it before only because a friend made me try some, though I’m a little freaked out by the hairlike texture, but Worchihan had a whole roti and enjoyed it. 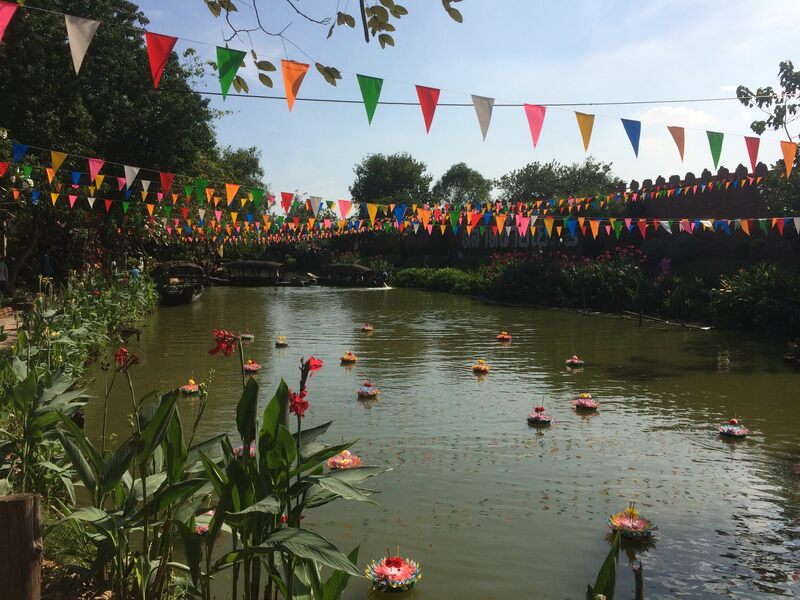 After visiting the temples with Ping and Som, we went to Ayutthaya’s (man-made) floating market. Unfortunately, we were stopped at the entrance because foreigners (me — everyone here thinks Worchihan is Thai) have to pay 200 baht just to enter the market, so we turned around and left. I did get a picture of the entrance though. 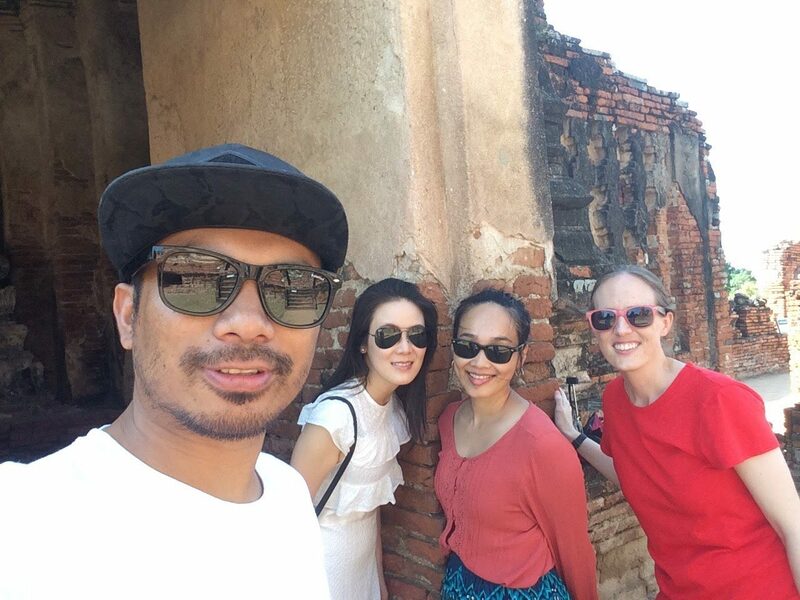 So, visit the temples we visited, eat boat noodles and roti sai mai, skip the floating market, wear sunscreen and enjoy Ayutthaya!